Tuesday night, Charlie spent the night at a friend’s house, while Joe and I went out for pizza and a movie. Joe did not get to bed Tuesday night until after 9pm, which is later than his usual 7:30 bedtime. And Charlie? Well, when I went to his friend’s house to get him the Mom informed me that the boys were up well past 11:00, which is much later than his usual 7:30 bedtime. 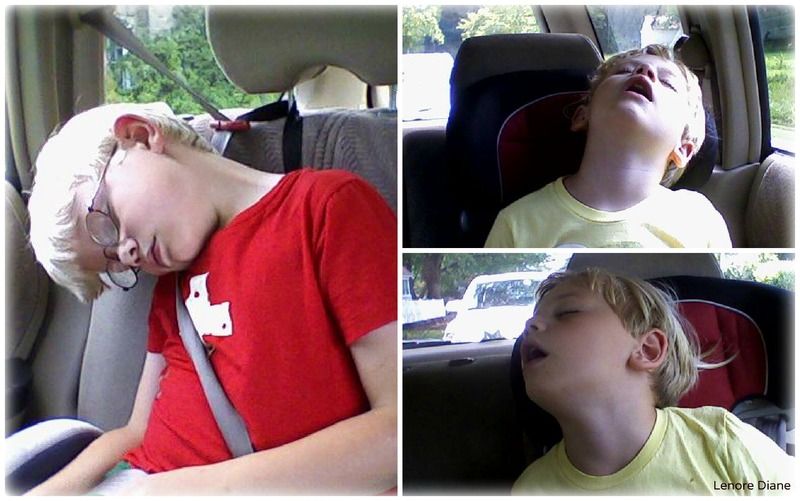 So, I was not surprised when I looked in my rear-view mirror on the way home from camp to find two boys zonked out. I snapped these shots while stopped at a red light. Guess what?! I used my cell phone! It is the perfect word, don’t you think? Cute! Funny…that’s how I look when I’m in the car as well. I can’t remember the last time I didn’t feel like that! Boy did I need this this morning LOL! (did I just say this this?) I do think this is my favorite post ever! Thanks and have a great day! I have a picture of three of my angels passed out on the way home from Grandma’s house. I am always amazed at the feeling of joy anf love when I see the kids like this. Too cute! It’s amazing how kids can fall asleep any where in any position. One of these days I’m going to have to upgrade to a phone that takes pics. It’s nice to be able to snap a picture without any notice. I did the same at a red light this afternoon! Okay, they look cuter doing it than I did, but still it’s a coincidence? Glad you had a giggle, MJ. Zonked fit nicely, I thought. Maxi, Joe has gotten into the habit of seeing each photo I post. If he sees me with the camera, he’ll ask “Is that for your blog?” I love seeing the smiles creep over his face when he sees a picture he really likes. Good stuff. Haha! Play hard and sleep hard. It is the only way to live, Peg. Too cute. They look like sleeping puppies. Isn’t this what summer’s all about? Stayin’ up late with your buddies and sleeping it off the next day. Yes! That is exactly it, Linda. They are milking the summer for all it is worth. Living large and playing hard… then zonking out at the end of the day. My neck would probably be stuck like that permanently, so I don’t sleep in the car. I feel for Joe every time I see his body flopped over napping.